B U B B L E G A R M: Lisa Shepherd - Brazilian Blowout..
Lisa Shepherd - Brazilian Blowout.. 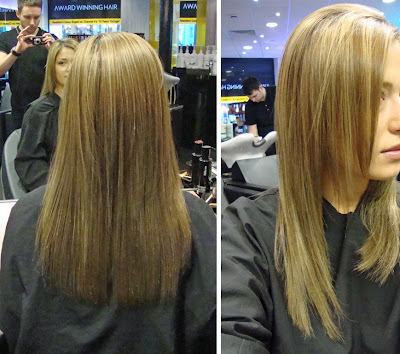 The Brazilian Blowout is the latest craze amongst celebrities and the hair industry. It's a hair straightening and taming solution that lasts for approximately 3 months. Sometimes it's known as the '3 month blow dry'. It claims to make your hair frizz free and more manageable by applying a keratin treatment to your hair. I had my treatment done at Lisa Shepherd award winning salon in London. At Lisa Shepherd they use Keratin Complex which is a completely formaldehyde free solution. See picture below for packaging. The salon itself is beautiful, needs no descriptive words. Wash hair with shampoo only. Section hair and apply Keratin Complex solution and ensure every bit of hair is coated. Leave the solution in for approx 30mins. Straighten hair with a straightening iron at 230 degrees to seal in the treatment. Do not wash your hair for 3 days. During the 3 days you can not get your hair wet at all which will prove difficult in this rain and snow, you can not tuck your hair behind your ears, you have to regularly brush it and if you wake up in the morning with a kink in your hair you have to flat iron it. You have to use a sulphate free shampoo in order for you not to strip the keratin from your hair. Here's me below whilst I have the solution applied to my hair. Look at how frazzled the tops of my hair looks due to damage from heat and chemicals. Eeew! ..and here's me waiting with the Keratin applied to my hair. Ta da! Here's the finished result. My hair looks smooth & improved! 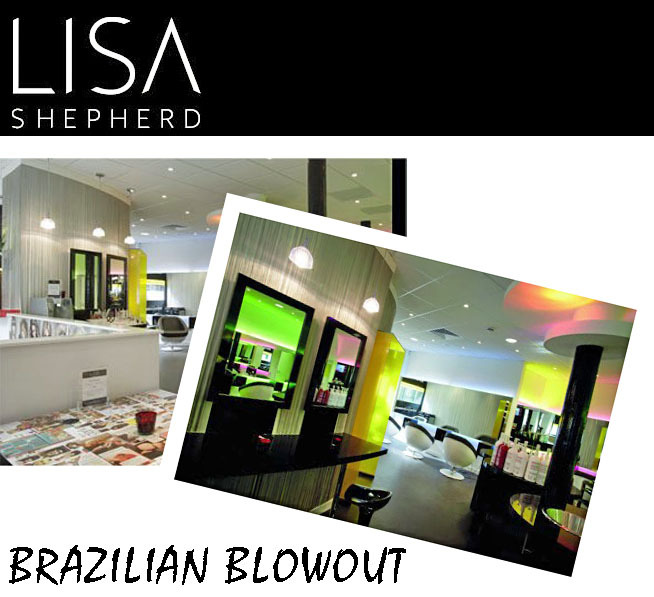 Prices for the Brazilian blowout at Lisa Shepherd range from £231-£359 depending on the length of your hair. However, I am happy to tell you Lisa Shepherd are offering YOU 20% off all of their treatments if you quote BUBBLEGARM. Brilliant! If you are in need of a treat then head over to Lisa Shepherd. The ultimate test will be when I wash my hair after 3 days and let it air dry. It looks pretty and I hope it lives up to the hype. Watch this space, I will do an update after about a week, I also purchased the keratin complex shampoo which should help my treatment last longer. Have you had the Brazilian blowout, or are you considering it? Disclaimer: This treatment was provided courtesy of Lisa Shepherd, I was not paid for this post and I am not affiliated with the company. Honest opinion as always! your hair looking fab! it is expensive but it looks like it does worth it...one of my friend had it last month, and her hair was damaged so bad due to straighteners and curling irons plus coloring her hair every month with peroxide based dyes..after the treatment she was saying that she cannot believe its her hair :) i am considering to have it as well but the maintenance is not easy...not tucking my hair behind ears?? impossible :) but im again telling you your hair is looking fab!!! I've known about this treatment for some time now, many hair types can benefit from this treatment. Your hair looks very healthy, shiny and smooth, I love your results. I really want to do this, but i'm afraid i just can't afford it....not fair...maybe in a few years time, it will be affordable like all other things, great post Muhsine!!! hate to burst the bubble, but the claim of keratin complex being formaldehyde free is rubbish. it is one of the products that have just been banned in canada as the latest country (other countries banning these treatments include italy, ireland, australia...). be informed... these treatments are dangerous. also what all of these companies are atm doing is replacing the formaldehyde with different versions of the chemical that then turn into formaldehyde during the process (with heat). basically: if it works, it has formaldehyde. Actually, even the ones who claim to be forme free have derivatives in them. This is the actual stuff that tames you hair. That said, because it is soo expensive i ordered the treatment online to do it myself and it works great. I use the encanto do brasil one, with this blowout you dont have to wait three days. Thats a big plus for me. Love ebay:). My work colleague has this done twice a year as with very curly hair and a 3 year old it is just a lifeaver. To be honest even if it did contain formaldehyde I doubt she would care as she loves it so much! Just to pick up on the Formaldehyde issue. I'm a Brit living in Brazil, where these treatments began life. It's called Escova Progressiva in Brazil and over here the Formaldehyde problem was dealt with as far back as 2007 when a Government ruling via the Brazilian Ministry of Health banned the use of Formaldehyde and introduced tough legislation for companies producing Escova Progressiva, or Brazilian Blowdry, products. What it meant was that companies went away to work on new and safe formulas. Fast forward to today and Escova Progressiva treatments made by companies like Zene Progress, NovEx and KeraMax create fabulous results even tho they contain no Formladehyde. My advice, after reading about the recent scares over a few of the products currently available in the UK and America is to stay away from same day products and where possible Buy Brazilian! Real Brazilian I mean, rather than something that just uses the words in its title. I'm a regular user of the Escova Progressiva system and I'd hate to stop now. It's changed my styling routine forever! It's much cheaper here in Brazil. The Escova Progressiva is no longer in trend, but the Escova Inteligente, that makes the hair looks more natural.